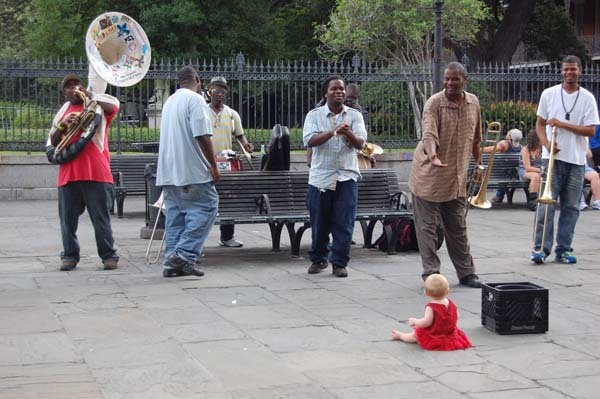 And then there’s incidental music, like one finds in New Orleans. Every road trip has a soundtrack, and every road trip has a theme song. The soundtrack is contrived: Melani spends a good deal of time organizing playlists—in the old days, burning CDs. She has her favourites and mine, playlists for children and playlists designed to make me speed (it works). A theme song is more serendipitous—you never know when or how it’s going to happen. It’s just meant to be. My mother and I drove across Canada in the mid-1980s, installing in newsroom printers across the country a chip my dad had designed (and slapping on each printer a shiny sticker that said, “The Juhl Box.”). With us in the car were our CBC favourites: Peter Gzowski on Morningside, Jay Ingram of Quirks and Quarks and the Royal Canadian Air Farce. But when we hit the Rockies and the radio signal couldn’t get to us, we spent a day and a half listening to the only eight-tracks we had: Olivia Newton John and Frank Sinatra. Not long after that, Melani road-tripped with her mother to Winnipeg, leaving me to look after the cats, Nic et Pic. When I walked in the door, her little radio was playing Richard Marx’s Right Here Waiting. And each time I turned on a radio during her absence, there was that song. Oh, stop giggling. It was 1989 and we were teenagers. It wasn’t much better when we made the cross-country journey with three-year-old Trevor nine years later. He made us play She’ll Be Comin’ Round the Mountain all the way from Montreal to Sundre, Alta. Nonstop. It’s exhausting to even think of it. Melani chooses the music because she’s more qualified. I’m tone deaf and I can’t quite tell the difference between Arcade Fire and Earth Wind and Fire. If I remember a band or song, it’s probably because it was popular when I was in my teens or early 20s: Sting, Dire Straits, Peter Gabriel. So I’m not sure how I got away with playing my trucker CD for nearly an entire road trip. Guess she decided to pick her battles. Melani discovered The Civil Wars when Jilly was a tiny baby. More importantly, she discovered that Barton Hollow was recorded with some sort of fairy magic that instantly calms babies. “Play her song! Play her song!” became the frantic plea on the road to Texas and back. She still quiets and smiles when she hears the opening bars.